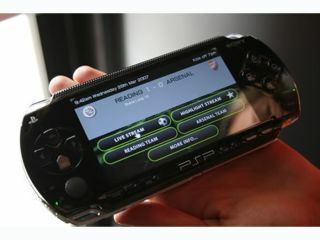 Sony's PSP is being used to show match stats and replays at Arsenal. Just as the PlayStation Portable has had its firmware updated to make it that little bit more useful, so we receive news of an unusual trial involving the Sony handheld system in the UK. So far, only Japanese PSPs have been able to download the update to firmware version 3.30, which adds a range of new screen resolutions for showing H.264 MPEG-4 videos. The usual release pattern should see the update released first in the US within days, then in Europe in a few weeks. Aside from adding high-resolution 720 x 480-pixel playback, the new firmware also adds menu thumbnails for videos and RSS items and better performance from downloaded PSone games. Elsewhere, Arsenal FC's Emirates Stadium is about to host an unusual field test using PSPs in the hands of football fans. The new S.PORT system will be tested by wirelessly beaming replays and statistics to PSP screens during Arsenal games at the stadium. Reports suggest that the new technology could be used in other venues for different sports, so don't be surprised to see legions of nerds fumbling with their toys blissfully unaware of another goal bursting the net or a streaker on Centre Court.